Bunaken is one of Indonesia's most famous dive areas, and it draws scuba divers from all over the world. In addition to Bunaken itself, a rather featureless banana-shaped island, the national park includes the neighboring islands of Manado Tua, a distinctive cone-shaped extinct volcano, Siladen, Montehagen, Nain, and Nain Kecil. 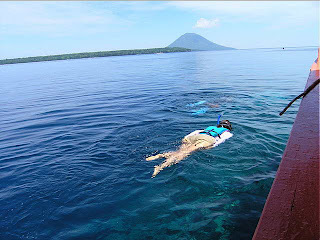 Bunaken is about 45-60 minutes by boat from Manado. Most resorts will arrange transfers from the airport for their guests. Alternatively, a public boat leaves daily except Sunday at 2PM, or you can charter a boat anytime. Bunaken is part of the Bunaken National Marine Park, which has some of the highest levels of marine biodiversity in the world. Scuba diving attracts many visitors to the island. 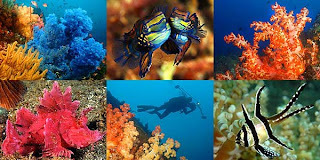 Bunaken is located at the north of the island of Sulawesi, Indonesia. It belongs administratively to the municipality of Manado. The Bunaken National Marine Park was formally established in 1991 and is among the first of Indonesia's growing system of marine parks. The park covers a total surface area of 890.65 km², 97% of which is overlain by sparkling clear, warm tropical water. The remaining 3% of the park is terrestrial, including the five islands of Bunaken, Manado Tua, Mantehage, Nain and Siladen. Although each of these islands has a special character, it is the aquatic ecosystem that attracts most naturalists. The waters of Bunaken National Marine Park are extremely deep (1566 m in Manado Bay), clear (up to 35-40 m visibility), refreshing in temperature (27 to 29 °C) Pick any of group of interest - corals, fish, echinoderms or sponges - and the number of families, genera or species is bound to be astonishingly high. For example, 7 of the 8 species of giant clams that occur in the world, occur in Bunaken. The park has around 70 genera of corals; compare this to a mere 10 in Hawaii. Although the exact number of fish species is unknown, it may be slightly higher than in the Philippines, where 2,500 species, or nearly 70% of all fish species known to the Indo-western Pacific, are found.